I tried to get us going early enough to run errands, have dinner, and get ornaments on the tree. Although I called Ogre at the time he requested of in 30 minutes, I did not get a reply until an hour later. He had even asked me to think of a place for dinner, which I did, but we couldn’t go to those choices because we were now going to be running late again. Awesome. Since one of the places he needed to go to was Lowe’s, he suggested Abuelo’s. I drove over from Lala’s house and Benji was very close to falling asleep. 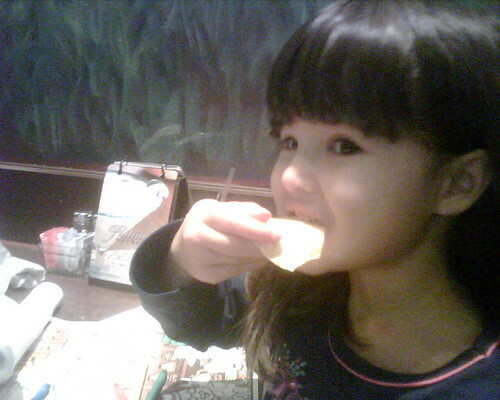 He didn’t fall asleep, though, so we switched cars and picked up Mina and headed to the restaurant. He was in a fine mood until he said “Nah..in” (usually napkin), but when Ogre gave him a napkin he went beserk and threw it on to the floor board. Let’s just say he never recovered. We walked in to the restaurant and I could tell the hostess was a little wary of our little monster. Ogre went ahead and requested for us to sit somewhere in a corner away from the rest of the restaurant patrons. She gladly obliged. The waiter met us at the table and we immediately ordered drinks and queso. I got a call as Ogre was putting Benji in his seat. I think that pissed him off even more. Upon my return, I found Benji thrashing about in his seat still screaming, “NAH IN!” We tried to give him water, something to play with, napkins (both paper and cloth) and he would just fling them across the table. It was not a pretty sight. When the waiter returned with the queso and the small empty bowl we requested, we gave some to Benji and Ogre could tell he was going to probably throw it and he tried, but Ogre kept the bowl from flying. I didn’t see exactly what happened next, but Ogre was telling me to give him a napkin, not to appease Benji, but to wipe the queso off his and Benji’s fingers and then Ogre decided to leave with Benji. 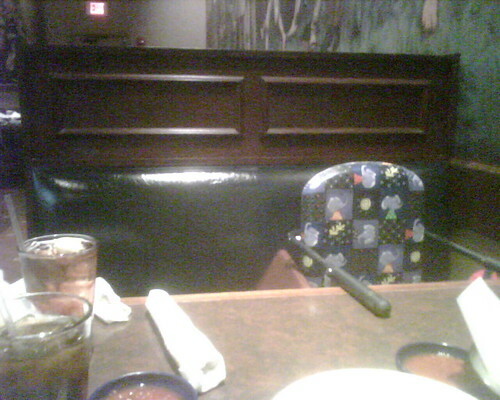 So, that left Mina and I to have dinner together. She was a very good girl at dinner in stark comparison to her wicked little brother. 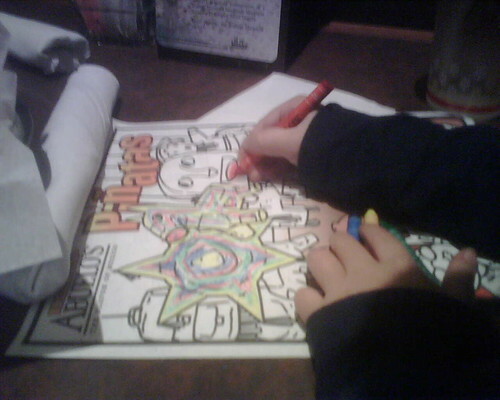 She was coloring her activity booklet and eating her queso. She and I ordered dinner and chatted about school and this evening’s events. She was very excited to hear that we were finally going to put ornaments on our tree! I told her we’d also get to eat some chocolate tonight. I got an even bigger smile. She wanted to know how many pieces of chocolate she’d get to eat. I told her two. She wanted seven. Uh, no. 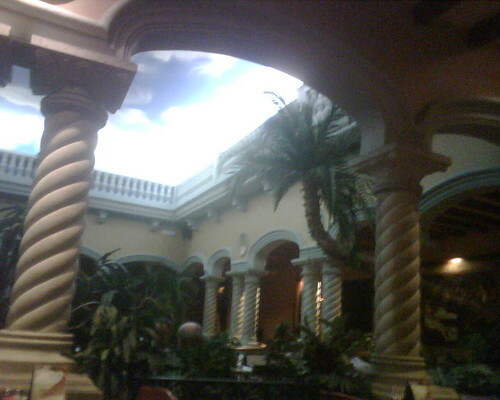 Mina commented that this restaurant was “really cool” because it looked like we were eating outside. Except that instead of being 37 degrees, it’s a constant 75 degrees in here. Ahhhh. Our dinner came out and she was happy to eat her nuggets without much prodding, but with a lot of questions of which part of the chicken she was eating, where was that on the chicken’s body. Nice dinner conversation. She took her requisite bathroom break. I did not see a changing station, but I did not look in the handicap-accessible stall. We sat down and finished up dinner. Ogre and I were texting each other as offered to order something for him, but he decided he’d skip it and we made a plan for when we’d get picked up. He was going to get some dog food, so I ordered dessert for Mina and me…always in search of the elusive best flan ever! Where was Ogre when I needed to pawn off difficult questions. I left it at I don’t know, it’s part of the magic. Luckily for me, the flan arrived. She wanted the mint leaf off of the plate and I let her have it and told her to smell it. I thought she would like it. 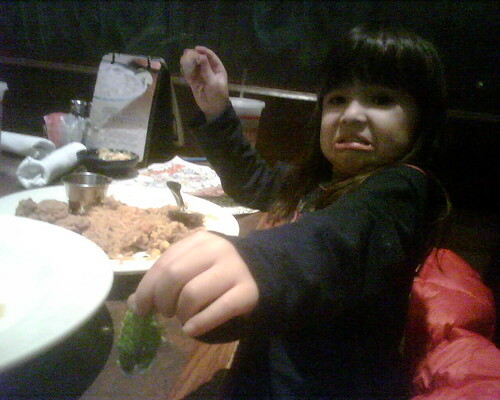 Why or why would I think that my vegetable hating daughter would like a green leaf?! Nope, she thought it was stinky and said it smelled like really bad mouthwash. 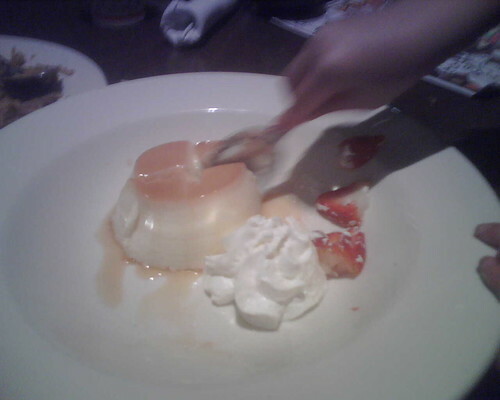 She then proceeded to cut up the flan -half for her and half for me. I happily ate my half and finished it in no time. It was very good. Mina was eating hers happily as well and then said to me as she put her spoon down, “I think I’ll only eat two pieces of candy tonight, I’m really full.” Wow. Okay. Then she said, “I don’t want anymore.” (referring to the flan). Woo-hoo! I thought in my head, more for me!! They served good ol’ Tex Mex here. 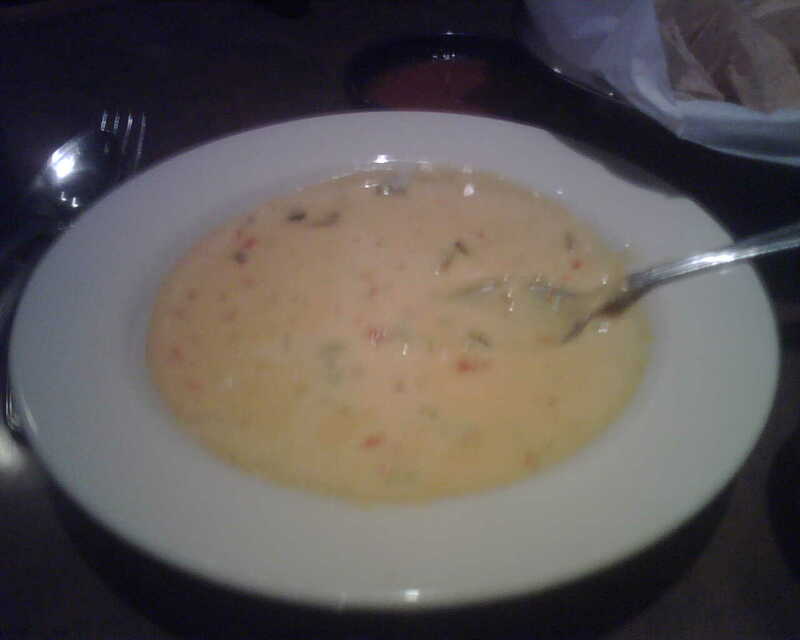 The queso that we ordered as an appetizer was nice and creamy, but had a little too much pico for my taste. That starts to remind me of college and Rotel queso. I ordered two enchiladas. One was the shredded beef with queso atop it. You can really go wrong with putting queso on top of anything. It was pretty good. The beef was seasoned well, but overall, it was good, not outstanding, but not bad, just good. 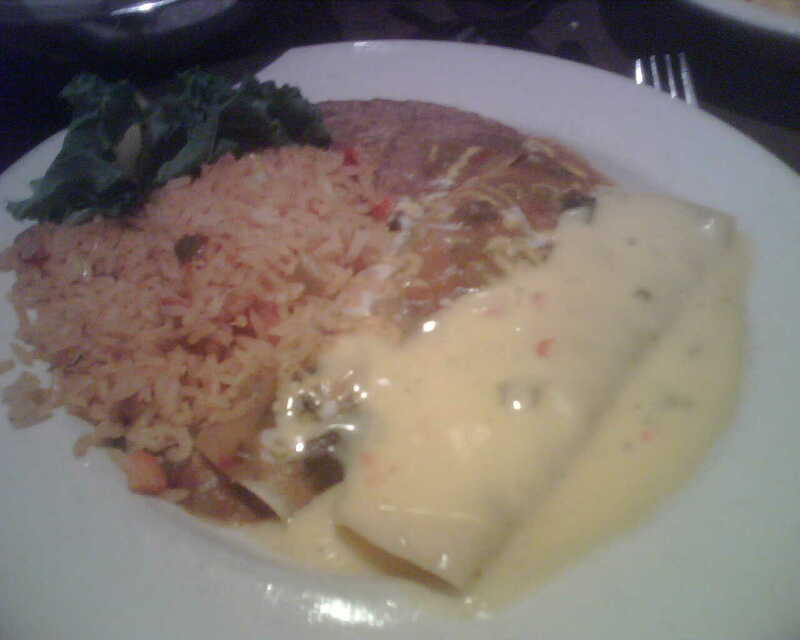 Same with my chicken enchilada with green sauce. It was good, but it didn’t have that tangy tomatillo flavor that I enjoy and had a heartiness to it that I was not expecting. Mina ordered the Chicken Nuggets with Rice and Beans and told me that she liked her Chicken Nuggets and that the rice and beans were good. The flan was a very pleasant and welcome surprise. It was very creamy and a nice eggy and vanilla flavor. It was more dense than the flan at Mario’s Chiquita (I still like theirs better), but overall, an excellent flan. On the children’s menu they also have tacos, enchiladas, tamales, nachos, burritos, quesadillas – a nice extensive menu for $4.99 and it comes with fries or rice and beans. I’d have to say that our service was above average and were very patient with our Fiasco of a family tonight. They were very accommodating and our waiter was attentive. I never had to request a refill, he checked on us, cleared our plates and was just overall a good waiter. I also noted that he did not charge us for Ogre’s tea, which sat practically untouched. That was a nice and unexpected. 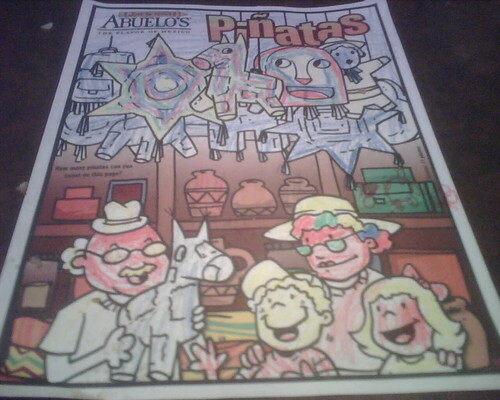 Definitely a kid friendly restaurant. Too bad Benjamin wasn’t a restaurant friendly kid today. 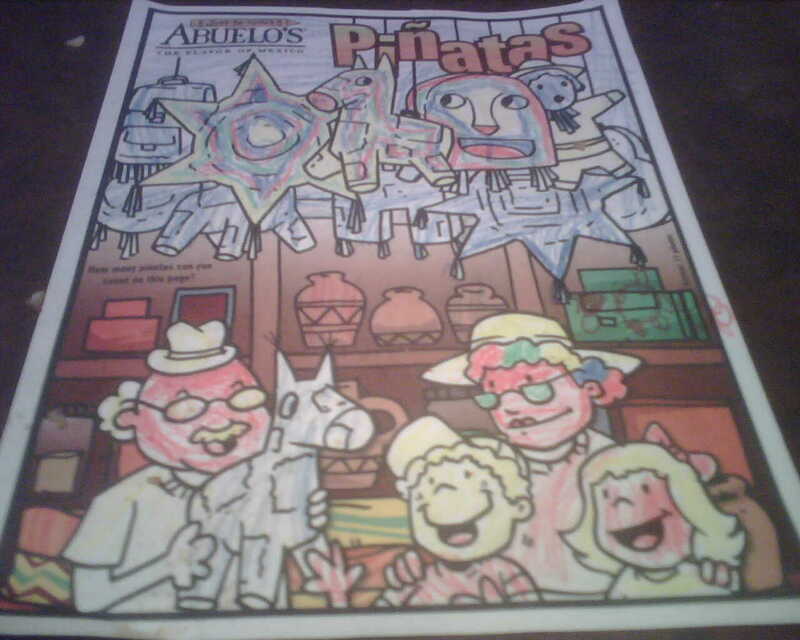 They have crayons and a nice little booklet of coloring and activities for the kids. Their kids menu is extensive and reasonably priced and portioned. Tex-Mex is one of those objective things, but I’ve never been one of Abuelo’s groupies. Sure, I’ll eat her if suggested, but I’d never seek out Abuelo’s…of course, now that I’ve had this flan, I may have to come back for that! 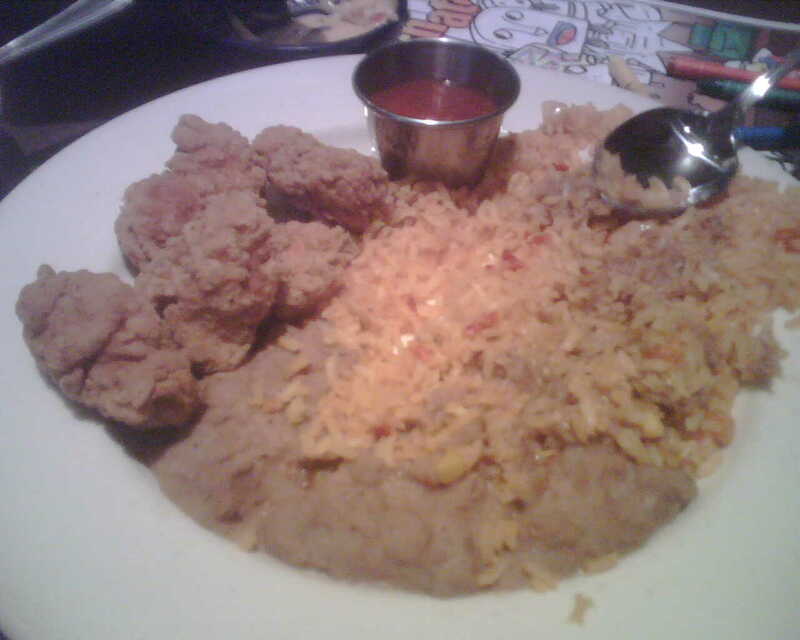 Overall, good Tex-Mex, and definitely kid-friendly. Just for the record, I never did get to decorate the tree. I ended up with two admissions waiting and a hailstorm to drive through. I didn’t think it fair to have Mina wait ANOTHER day to decorate our tree, so I gave the green light to do so without me. Maybe next year we can plan better. Or better yet, stay home for dinner! I found that the location makes a huge difference. The one at the Tollway in Plano had great food and good service (even when crowded), while the one on 75 had food that seemed microwaved and horribly timed service (kids-meal came last, entree 2 minutes after appetizer). we went to the one on….I 75. I think you are right about locations making a difference, we found that with Original Pancake House (we actually ate at the one near Stonebriar -I’d have to look again if that’s Frisco or Plano- and found that it had way better service.